How much more do I need to say then what I did in the title? Free coffee at 7-11 from 7 a.m. to 11 a.m. Go! Now! You only have 2 hours left! Opening Day Savings: On opening day (September 30th) bring a bottle of Dasani water or any coke product to the fair admission gates for donation to the North Texas Food Bank and get in for $5 per donation, per person. School Tickets: Every year, school districts in the area send children home with FREE admission tickets. Be sure to use and take advantage of them. Dickie’s Day: On Thursday, October 6, wear and show your Dickies logo clothing item at the staffed tent outside the gate and receive a voucher for free admission (only valid on 10/06/11). Museum of Nature and Science members: You should receive your free vouchers in the mail (mine came last week). Your voucher is good for two free adult tickets and up to four children tickets. McDonald’s Deals: McDonald’s offers $4 off general admission with their State Fair coupons (you can find these on tray liner or bag stuffers) any day of the fair. A free child ticket (with purchase of general admission) coupon is also distributed by McDonald’s. Ride the Dart: Parking at the State Fair costs $15! Don’t waste your money on parking, that $15 could go towards some yummy fried food! Dr. Pepper Tuesdays: Every Tuesday, bring an empty Dr Pepper can and enter for $4. Most rides on those Tuesdays (excluding the Thrillway, Texas Star, and selected other attractions) are just 5 coupons. Canned Food Wednesday: Make a quick trip to the store for some canned goods. Each visitor who brings 4 cans of food for the North Texas Food Bank will pay $2 admission. Movie Theater Freebie: No, don’t throw away your movie stub! Save it and Present a Cinemark movie theater ticket stub on Thursday and receive FREE admission. Coca Cola Thursdays: Bring an empty 20 oz. bottle of a Coca-Cola product and enter the Fair for $5 admission on Thursdays. Local Motion, Saturdays at 9am, provides free fitness classes. This week join us for a Zumba class instructed by Gloria Flores, Zumba JAMMER. Patio Sessions this week delivers an amazing performance by Dallas String Quartet. Looking for a relaxing place tolisten to local musicians and enjoy the great outdoors? Join us every Thursday, 5:30pm-7:30pm in Sammons Park. Sunset Screenings, presented in partnership with the Dallas Film Society, brings you free outdoor movie screenings,the third Saturday of each month, in Strauss Square. This week is Waiting for Guffman! Texas Tech and Baylor University will battle live at Cowboys Stadium on Saturday, November 26, 2011. Look, we all know it's not cool to run around sporting "Juicy" on your a**, but that doesn't stop people from doing it. But what if you could show your school pride by wearing it on your jeans. Check out OCJ apparel's website to find awesome jeans for SMU, TCU, Kansas, Mizzou and others. http://www.ocjapparel.com/ You'll be the best dressed gal on the Boulevard. Pony Up! You're the driver when Texas Motor Speedway opens the Speedway to the public for the last time this year. Experience the thrill of driving your car around the 1.5-mile superspeedway all to benefit the Speedway Children's Charities at Texas Motor Speedway. Polish up your special vehicle and come on out to "The Great American Speedway!®" on Saturday, September 10, 2011 for Laps for Charity II. Take three laps on the 1.5 mile Super Speedway behind a pace vehicle for just a $30 and have your picture taken in Victory Lane for an additional $10. Once again our fan favorite VIP Laps Experience will be offered for $250. Laps will be conducted for Car Clubs (by reservation) from 5-7 p.m. and for the General Public from 7-10 p.m. No reservation is needed for the General public time. For more information please contact the Speedway Children’s Charities office at (817) 215-8421. Click here for more info. Have You Ever Wanted to Be a Unicorn? Extreme Mutt Makeover is Coming! 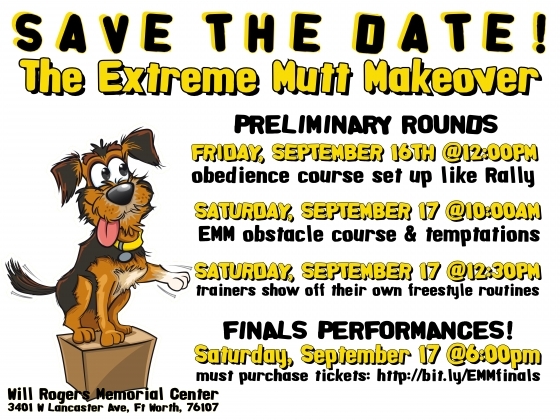 The Extreme Mutt Makeover event is open to the public free of charge with the exception of the finals performances that will be on Saturday evening. Tickets must be purchases to see the finals. They can be purchased here. The entire event will be held at the Will Rogers Memorial Center in Ft Worth at 3401 W Lancaster Ave, Ft Worth, TX 76017. There will be 15 dogs & their trainers that compete in 3 rounds of preliminaries then, based on the 4 judges scores, the top 3 compete in the finals round. My friend (and dog trainer) Stacy, has been working with Jazz. Go cheer her on and become a fan of Jazz on Facebook! The iconic musical "Hair," winner of the 2009 Tony Award for Best Musical Revival, is heading to Dallas straight from its most recent Broadway run, and tickets are now 50% off. • Tuesday, Sept. 20, at 8 p.m.
• Wednesday, Sept. 21, at 8 p.m.
• Thursday, Sept. 22, at 8 p.m.
• Sunday, Sept. 25, at 2 and 7:30 p.m.
• Tuesday, Sept. 27, at 8 p.m.
• Wednesday, Sept. 28, at 8 p.m.
• Thursday, Sept. 29, at 8 p.m.
• Sunday, Oct. 2, at 2 and 7:30 p.m.
What's more fun than grabbing a tasty brew and watching animals at a bar? How about grabbing a tasty beer and watching live animals at the zoo. I thought so. Get your tickets NOW! The Dallas Stars 11-12 season is just around the corner and tickets for Oct-Dec home games go on sale on Friday, September 9. Through this special offer, you can buy tickets to some of the hottest games before the general public! Secure the best seats before they sell out! Use code 'STARS' during checkout to redeem this presale offer. Plus, tag your seat with Ticketmaster + Facebook so your friends can see where you are sitting. Learn more! Enter code: STARS into Enter code here Box. Tony Award-winner Patti LuPone joins the Dallas Symphony for one night with tickets for 50% off. The singer will perform hits from her Broadway career as well as some of her personal pop favorites. Think "Don't Cry for Me Argentina." So, Sig-O and I hit this up last quarter and it is SUPER fun and SUPER cheap. For $10, you get a glass (to keep, I'm working on creating a full set so I stole Sig-O's last time) and you go around to all the fun stores on the Cedar Springs strip drinking and shopping. Restaurants (Dish - cheap flatbread) and bars ($3 you-call-its at JRs and Sue Ellens) also have fun specials. Word to the wise - don't expect great wine at every stop, but expect to have a really good time. Recommended first stop: Nuvo. You're welcome. Ok, first off, I'm apologizing for being so lax in my blogging duties. Yes, I should have posted more stuff recently, but I haven't. There a several reasons for this. I was on vacation. Yes, a real vacation. And you're welcome, because I'm the one who brought back this nice cool weather from Colorado. I didn't work on vacation. I didn't blog on vacation. I didn't even turn my laptop on while I was on vacation. And it was freaking awesome. There haven't been any really awesome deals that I've seen that I think are worth sharing. Sure, I could share with you the crappy lose weight, liposuction, botox, get your hair done, mediocre food deal, but that's not fun. I don't even like reading those, so I choose not to pass those along to you. You feel jipped because I haven't been posting, when really I'm doing you a favor by not posting junk for you to read. I have to work. Blogging does not pay the bills. Just about every blog you read, minus those really professional ones or ones with a huge following, is done by someone who does something else to actually generate income. We don't blog for the money or the spotlight, we blog b/c we think we have something to share with you. Do your fave bloggers a favor and click on an ad or two on their sites if it's something that interests you. Yes, ads are annoying, but it's really the only way that your fave bloggers will make money from a website. You don't talk to me. Every now and then I get a comment, and that's swell, but generally I end up feeling like I'm just posting to the magical internet and some randoms find the page. So follow me, comment when you want to and tell me what you actually want to know about. Otherwise I'm just guessing. Ok, speaking of that #4 thing, I have to work. I promise to be more diligent about posting, but don't blame me when I'm on vacation. You should try it. Without your computer. You'll thank me.